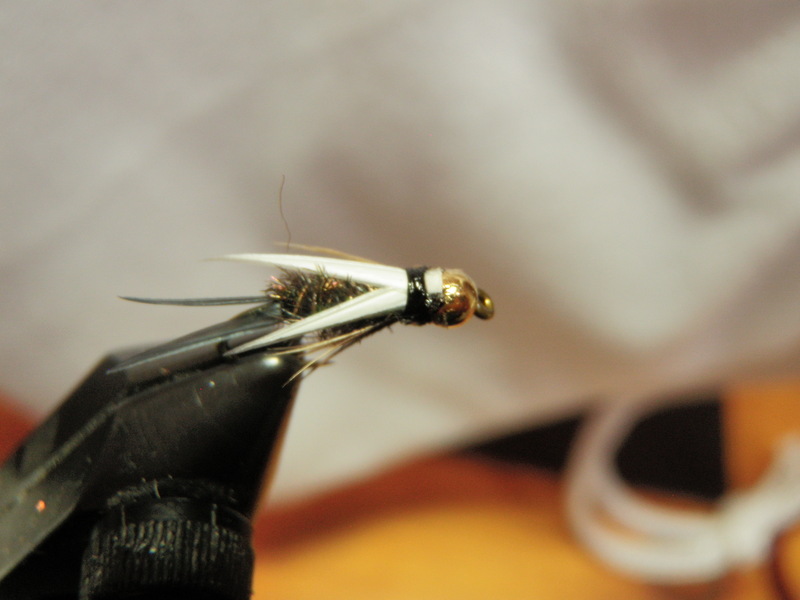 The cream parachute hopper has proven itself as a great late season fly. This fly always lands in the proper alignment, presents the triggering feature of large splayed legs, and offers a large white wing post that makes it easy to spot on the water. On a late season hike to Wildcat Canyon, my friend Gregg Sutherland captured a couple hoppers and flicked them into the river. 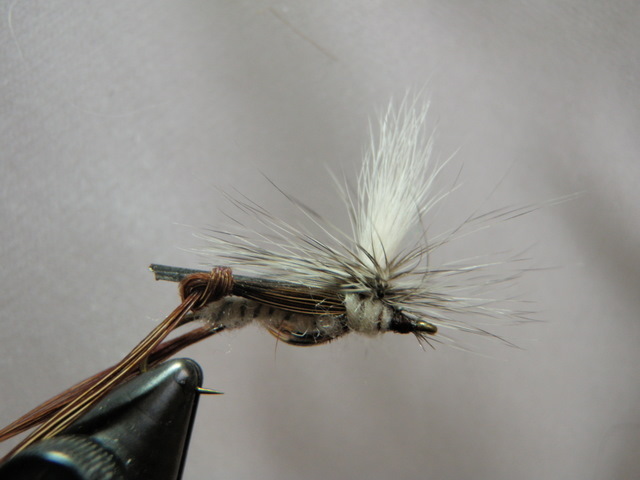 Before he offered them to the trout, I inspected the abdomen and noticed a segmented creamy underside, so I decided to imitate this in my new parachute hoppers. The yellow body Letort hoppers seem to work well in the early summer season, but when late August and September roll around, the parachute hopper seems to be more productive. I decided to produce eight cream parachute hoppers for the upcoming 2012 season. 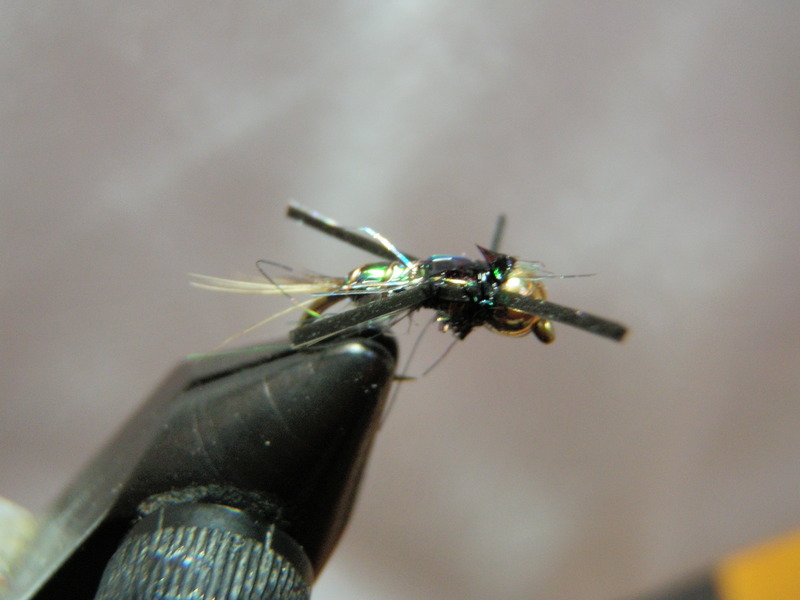 On the same trip to the Conejos River when I purchased western green drakes I also purchased some dark beadhead nymphs with iridescent backs and small rubber legs. I never asked what they were called so I’ve named them shimmering pheasant tails. These nymphs were quite effective on the upper Conejos River on my first day of fishing there. I used the nymphs in a dropper configuration behind a Chernobyl ant and caught a lot of fish along the edge. I lost quite a few of the purchased flies, so I made sure to maintain at least one in my foam pocket to use as a model when I attempted to replicate. In fact I took the sample version with me on a trip to Charlie’s Fly Box in Old Arvada and asked the store salesperson to help me purchase the materials required to tie a shimmering pheasant tail. He did just that, and I returned home with two colors of ice dub, silly legs and a sheet of flash back black. 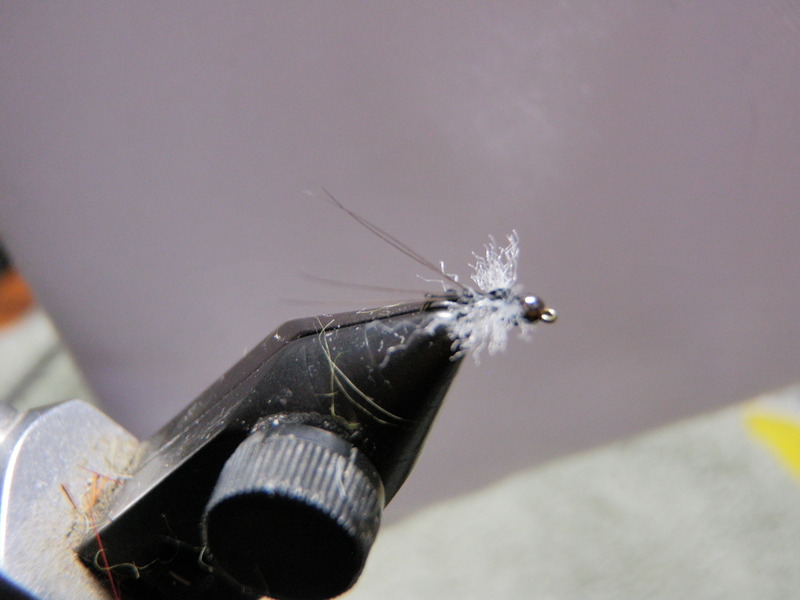 I gathered all the materials together and placed the purchased shimmering nymph on the magnet beneath my vise and began my first fly. First I threaded the bead over the hook point and slid it to the eye of the hook. Next I attached thread and wrapped it to just beyond the hook bend. I tied in a short stubby tail using pheasant body feather fibers. This was the only natural material in the entire fly. Next came a section of fine copper wire and then a strand of pearl flashabou followed by a thin strip of the flash back black. I opened the package of silver holographic ice dub next and observed that it appeared to be a massive clump of tinsel. How does one apply this metallic stuff? I took a small amount and twirled it on to the thread and miraculously it adhered just like natural dubbing. I pulled the flash back black up over the dubbed abdomen and then the pearl flashabou as well and then spiral wrapped the copper wire to the front of the abdomen. Next I folded the flashabou and flash back toward the rear over the abdomen and locked it there with a few turns of thread. Now for the thorax I grabbed the packet of black peacock ice dub and spun it on to my thread. I wrapped the black peacock from the front of the abdomen to behind the bead and then cut two small sections of black silly legs and mounted them on both sides of the thorax. Finally I pulled the flash back and flashabou forward over the top of the thorax dubbing and tied down and whip finished. I trimmed the legs to be even on both sides and as a last step coated the head threads and the entire top of the fly with Sally Hanson Hard As Nails. I removed the fly and placed it next to the purchased model and concluded that I’d produced a fairly close replica. This is another new creation I am anxious to test in 2012. One of the highlights of each fishing season is encountering a western green drake hatch. I can almost guarantee a green drake emergence if I visit the Frying Pan River between July and October. Hitting green drakes on other Colorado streams is more haphazard, but I’ve encountered them on St. Vrain Creek, the Roaring River, Clear Creek, the Fraser River, the Conejos River, and the Eagle River. If I only spot a few of these large mayflies by western standards, I immediately tie a green drake imitation to my line. Trout seem to have a long memory for green drakes, and because of their large size they are a treat to use as a prospecting fly. For the most part fish are not extremely selective to green drake flies; however, over time I have tied numerous varieties. My first attempts were intended to mimic some green drake cripples that I purchased in Basalt on an early trip. They were called green drake cripples and were tied with a marabou tail and abdomen, then a deer hair collar and then hackle. 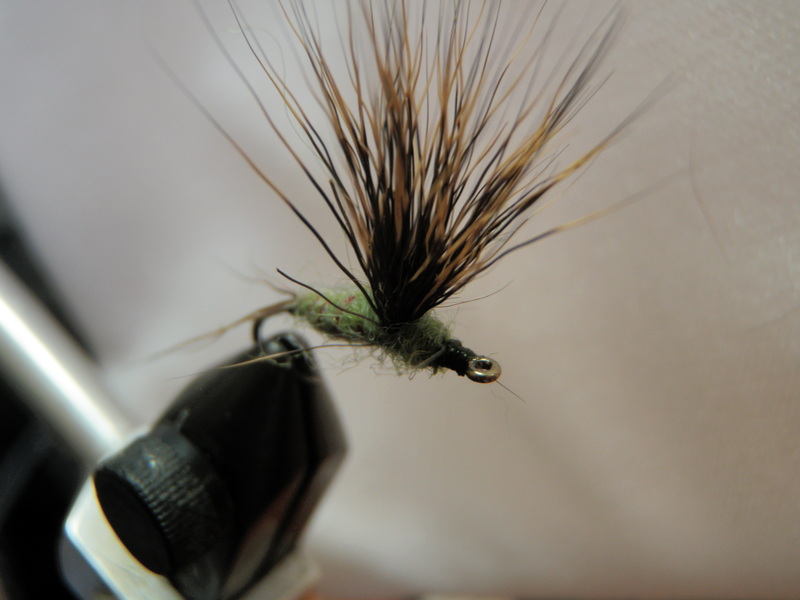 They were difficult to tie and I gradually used them up and moved on to comparadun style green drakes. I made these with many shades of olive dubbing and had varying results. This summer I traveled to the Conejos River in southcentral Colorado in late July and based upon the recommendation of the gentleman at the Conejos River Angler, I purchased a couple green drake flies. 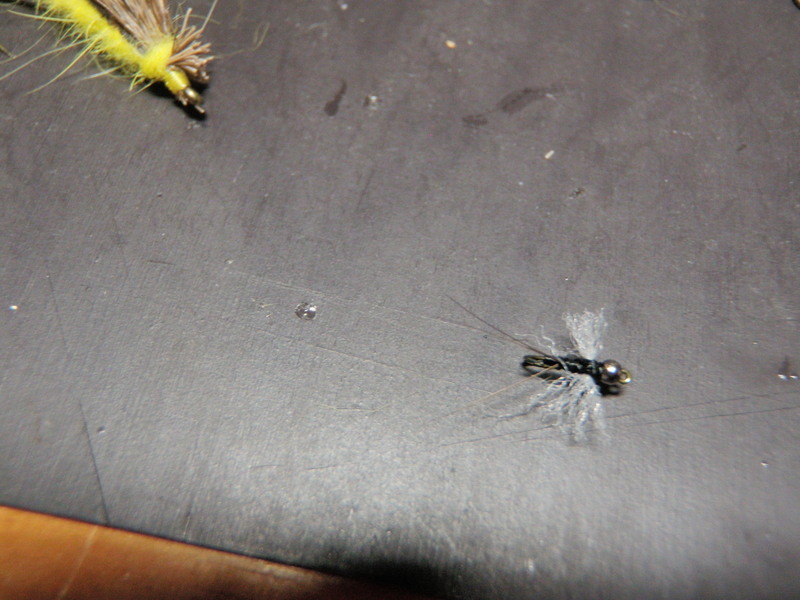 These flies produced quite well on my second day on the river in spite of a relatively sparse emergence. Subsequently the same flies produced fish on Clear Creek, but I lost all but one. Before I lost the remaining fly, I decided to use it as a model and produce some new ones for a September trip to the Frying Pan River. I used the purchased fly to determine that the proper hook size was 12 3XL. I also was able to find some dubbing labeled light olive that matched the abdomen quite well, and found some maroon sewing thread in Jane’s sewing box that was perfect for the ribbing. Dark coastal deer hair was the final ingredient for the wing. The fly I purchased was much bushier than my version, but I wasn’t sure how to attach the extra materials, so I stayed with the sparse comparadun pattern. 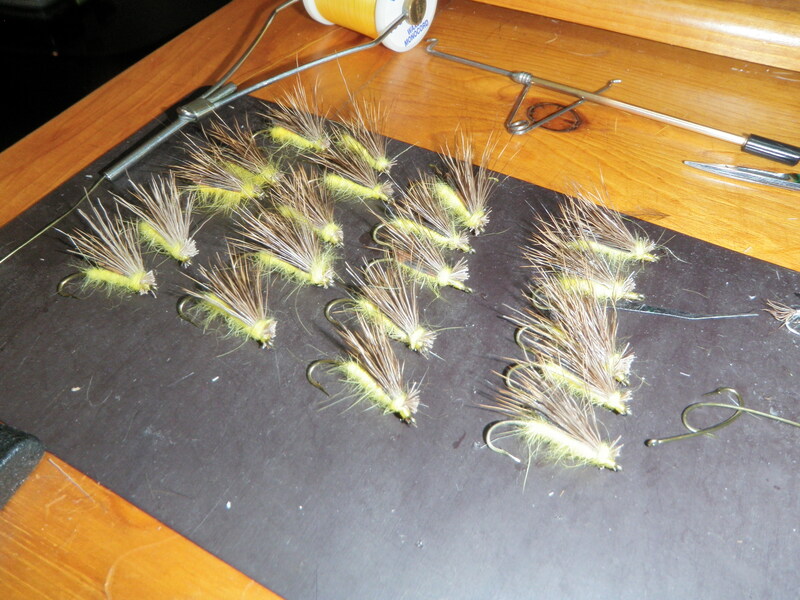 I stream tested these newly tied flies in September on the Frying Pan River and they performed like a charm. I landed four trout in a fifteen minute time period at the tail end of the green drake hatch, and Dan landed one as well. I was convinced that this was the model I would stick to for future years of green drake fly tying. I sat down at my vice over the weekend and whipped out ten size 12 3XL green drakes. I’m quite anxious to test them again during the summer of 2012. During September 2011 I made my first ever fishing trip to the North Platte River at Northgate Canyon. On my way I stopped at the North Park Fly Shop to obtain information about access and fishing conditions. The young man in the fly shop told me that tricos were hitting the water between 11AM and 1PM and BWO’s were emerging in the afternoon. Since I didn’t have more than one or two trico spinners I attempted to purchase some at the shop. Unfortunately North Park was out of them, but the young man I spoke with recommended buying sunken tricos. I purchased four or five sunken tricos and sure enough I noticed swarms of tricos above the riffles in the late morning. At around noon the tiny tricos hit the water and trout began to rise and sip them in. Since I didn’t have trico spinners, I added a sunken trico as a dropper to my large attractor top fly, and I was amazed to discover that the fish loved subsurface tricos as much as the ones floating on the surface. The sunken tricos I purchased had black bodies with wings made out of a material that almost looked like the clear plastic used to make baggies. I promised myself that I would make sunken tricos, but never got around to it last winter. Once again in September of 2011 I made a trip to the North Platte River and stopped at the North Park Angler. The same salesperson was present and once again recommended sunken tricos. I asked about the ones with the plastic style wings, and he no longer had those so I purchased some with black bodies and white poly wings. 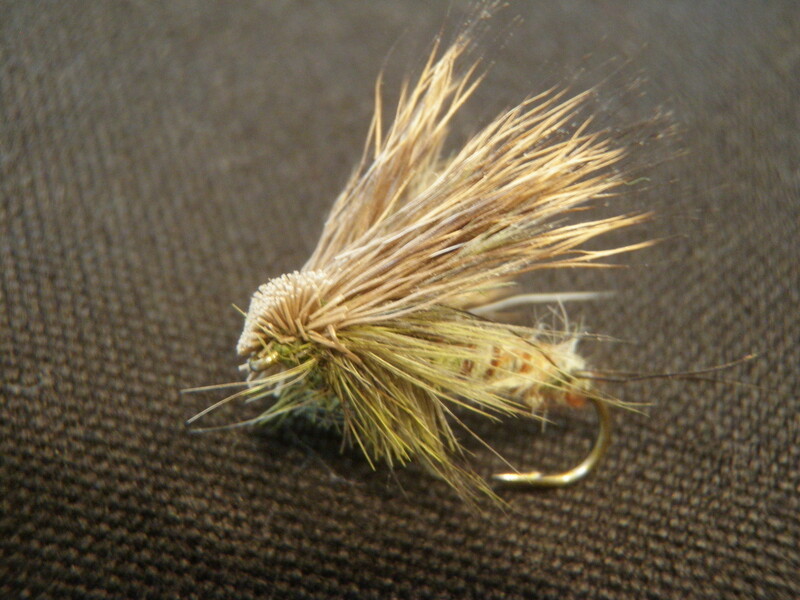 The wings were swept back over the body caddis style. I didn’t have any success on the North Platte with these flies, but on a later trip to the Arkansas River I managed to hook and land one or two fish on this version of a sunken trico. As I prepare for the 2012 season, I finally got around to tying sunken tricos. I searched online and found a pattern where the abdomen was constructed with fine black wire. I wasn’t convinced that a body made from fine wire would be narrow enough, so when I visited Charlie’s Fly Box to purchase materials I asked the clerk how he would make a sunken trico. He suggested tying them with a tiny black tungsten bead behind the eye of the hook so I bought some very small black tungsten beads. Early during this past week I sat down and tied six sunken tricos. I threaded the tiny beads on to the Tiemco 101 size 24 hooks and then tied tricos in the same manner that I have tied them since I began fly fishing and fly tying. 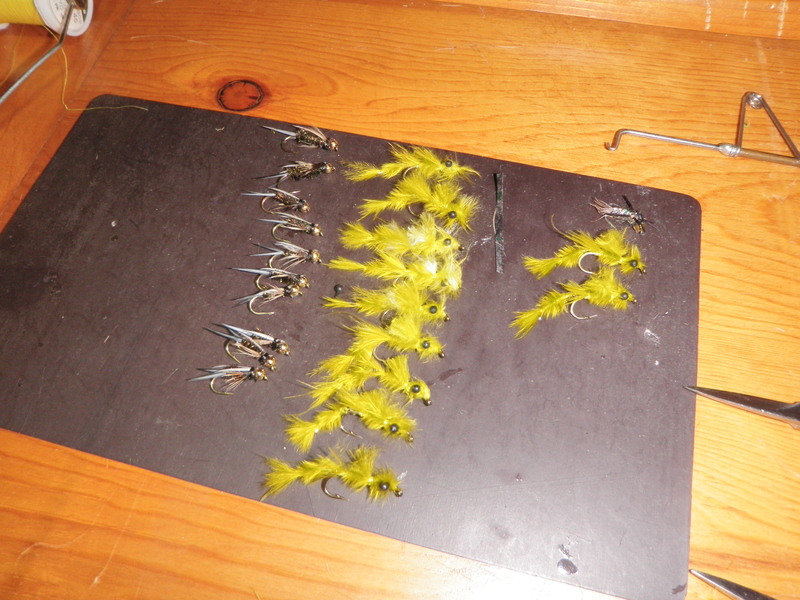 I stripped some stiff barbules from a large hackle feather and tied them in for tails. I wrapped black thread forward to create the abdomen and then I took a sparse clump of white poly yarn and tied it in behind the bead and used figure eight wraps to secure the spent wing. I like the look of this fly, and I’m anxiously anticipating encountering a trico hatch this summer to see how they perform. Quite a few years ago I tied five to ten damsel nymphs made with light olive marabou on a size 12 long shank hook. I didn’t fish these frequently, but I liked having them available in my fleece wallet particularly for occasions when I visited a lake. In June while waiting for the snowmelt to subside in Colorado I made a trip to the Rocky Mountain Arsenal warm water lakes. The first fly I tied to my leader was a damsel fly nymph as it was June and I observed a lot of aquatic vegetation. These were perfect conditions for damsel nymph migrations and hatching. I managed to land a small bass and decent crappie bass before losing my fly. 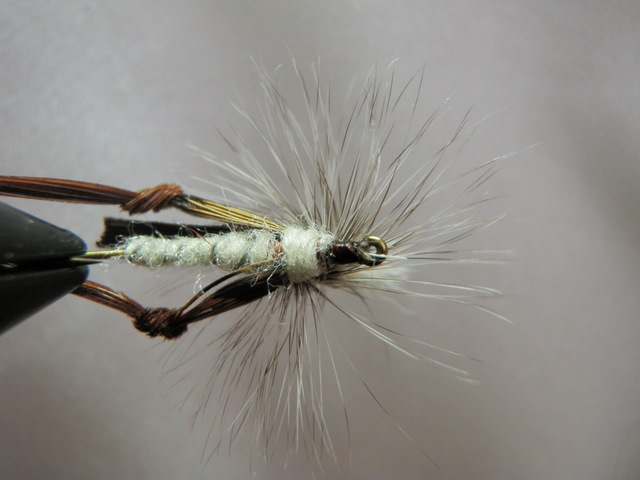 At this point I discovered that only one damsel nymph remained in my fly wallet so I resolved to tie more during the coming winter. Well that time was upon me, so I prepared to tie damsel nymphs. 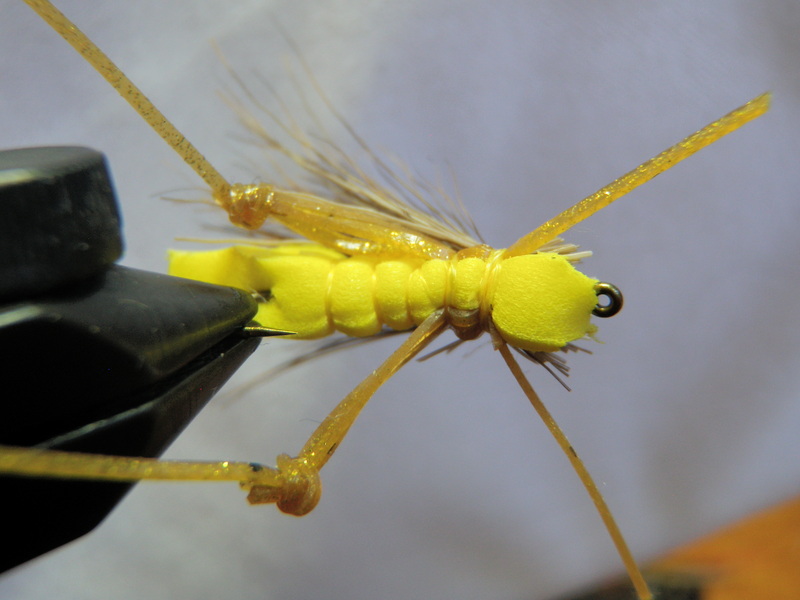 First I searched through my fly tying books and found a pattern in Charlie Craven’s book called the wiggle nymph, and another pattern called the twisted damsel in a book by Larry Tullis. Neither of these matched the ones I made previously, so I searched the internet and found one similar in style to the ones I tied before. Next I made a list of the materials I required and discovered that I had dark olive marabou but none of the light olive that was listed in the fly recipes. The wiggle damsel was actually an articulated fly that required two hooks. I never made an articulated fly, but used several that were quite effective in Alaska, so I decided to experiment with a new damsel nymph. I made a short trip to Bass Pro Shop on Friday night and purchased some small black beadhead eyes and 3X tippet to connect the two hooks, but Bass Pro did not have the desired light olive marabou. 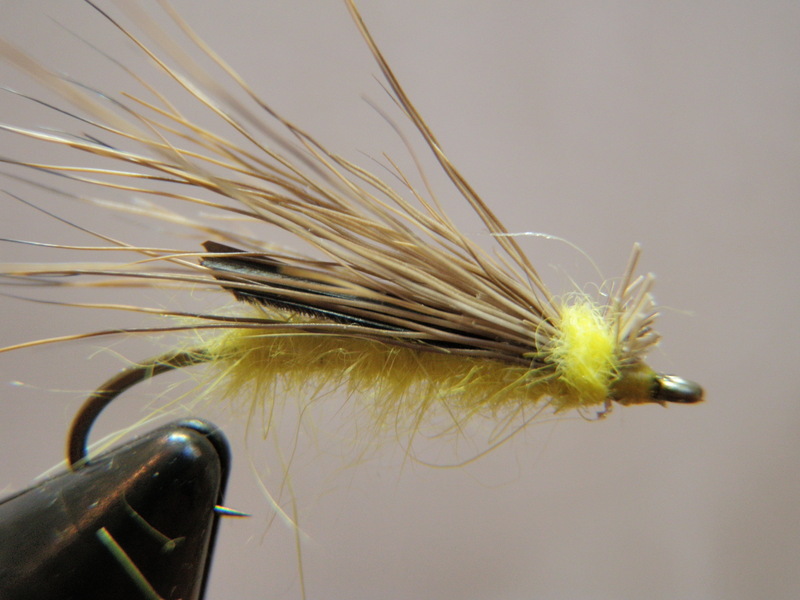 On Saturday afternoon after tying beadhead prince nymphs, Jane and I trekked to Old Arvada to Charlie’s Fly Box, and I purchased the highly sought after light olive marabou. On Sunday afternoon after watching the Broncos pull out another win over the Vikings, I sat down to manufacture wiggle damsels. I used a Mustad 9671 size 12 for the front fly and a standard size 14 dry fly hook for the rear. 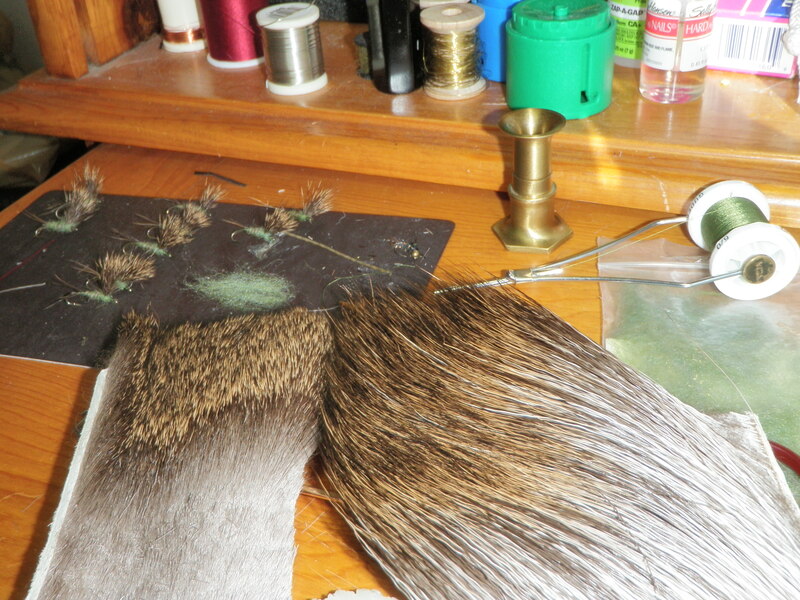 I tied 10 tails by tying down a clump of marabou fibers for the tail and then winding the clump forward to the eye. After whip finishing the size 14 hook I used wire cutters to cut off the bend and hook point and set these aside in a plastic cannister for subsequent use. Next I clamped the larger hook in the vise and tied in the black mono eyes with figure eight wraps and then moved to the rear of the front hook. I clipped a one inch section of 3X mono from the spool, threaded it through the eye of the previously prepared tail section and then bound the monofilament to the front hook so that the tail now dangled from the rear. 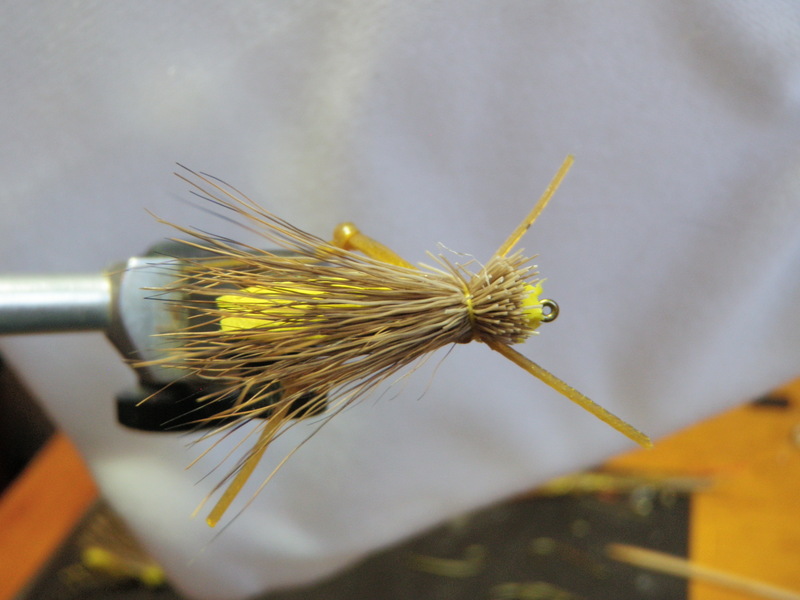 Finally I tied in a clump of marabou to the rear of the front hook just like I had done for the tail and then wound it forward, under the eyes and then back over the top of the eyes and finished off. I can’t wait to fish these flies as they look like great fish attractors. 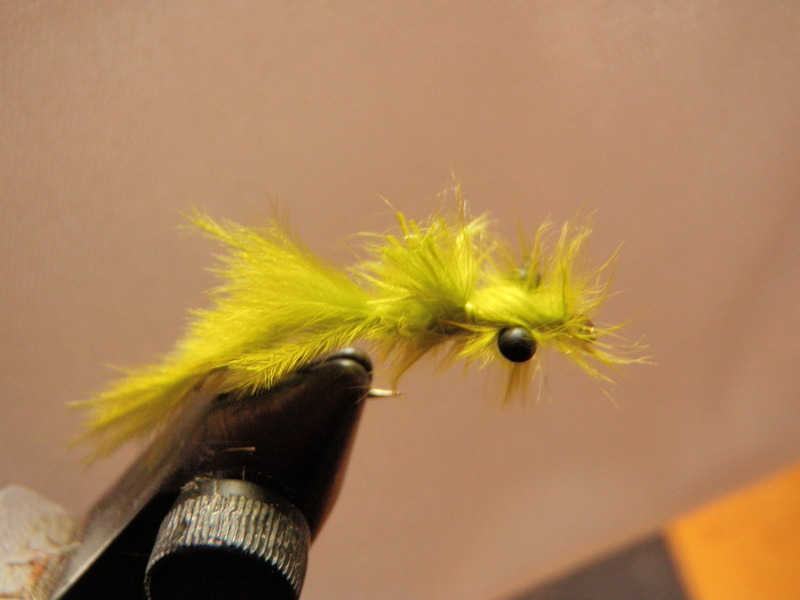 The wiggle tail and undulating marabou fibers should make this fly appear to be alive all the time. 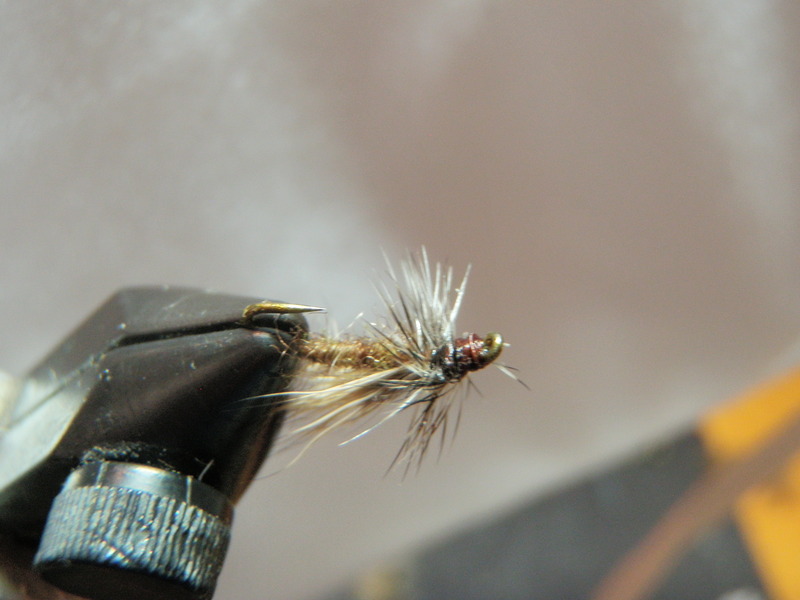 The prince nymph is another favorite fly of western fly fishers. This classic has great fish attracting features including a bead, iridescent peacock herl, and contrasting white wings. I always want to enter a new season with an adequate supply of beadhead prince nymphs. 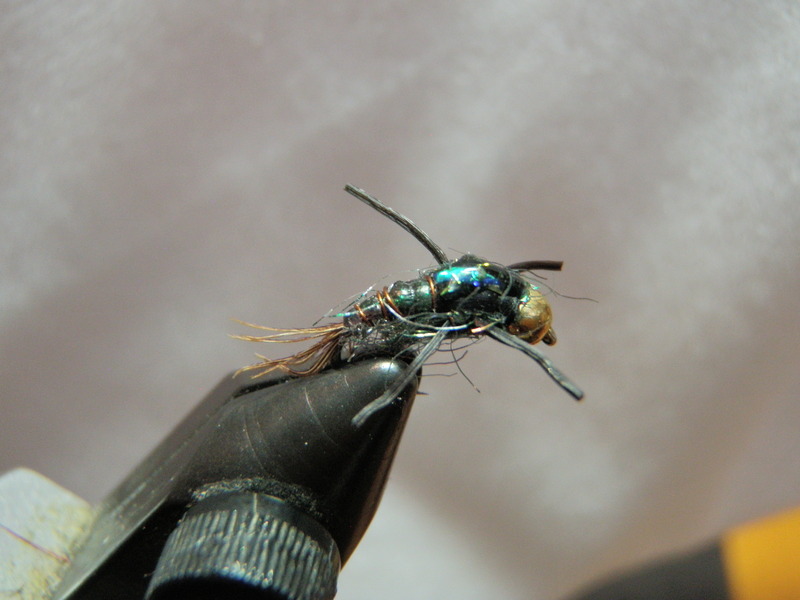 In addition, I’ve discovered that a prince nymph is highly effective during the caddis hatches on Colorado Rivers. I’m guessing they are a reasonable imitation of egg laying caddis that dive into the river and swim to the stream bottom to lay their eggs. I’ve had some great success with prince nymphs late in the afternoon after the adult caddis have already hatched. 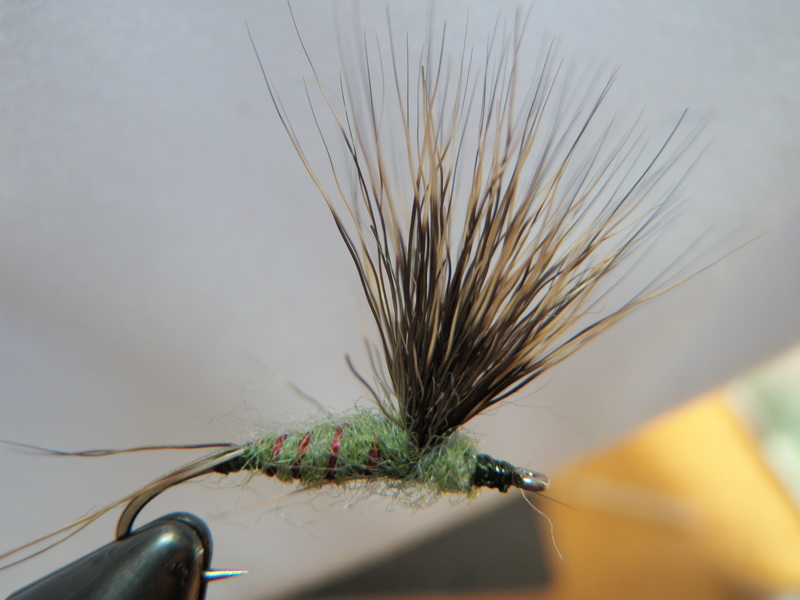 I was prepared to begin tying damsel nymphs, but discovered I didn’t have light olive marabou, so I moved on to tying beadhead prince nymphs over the weekend. The first five were weighted with wire, and the next five were unweighted. Hopefully I now have an adequate stock of this reliable producer. 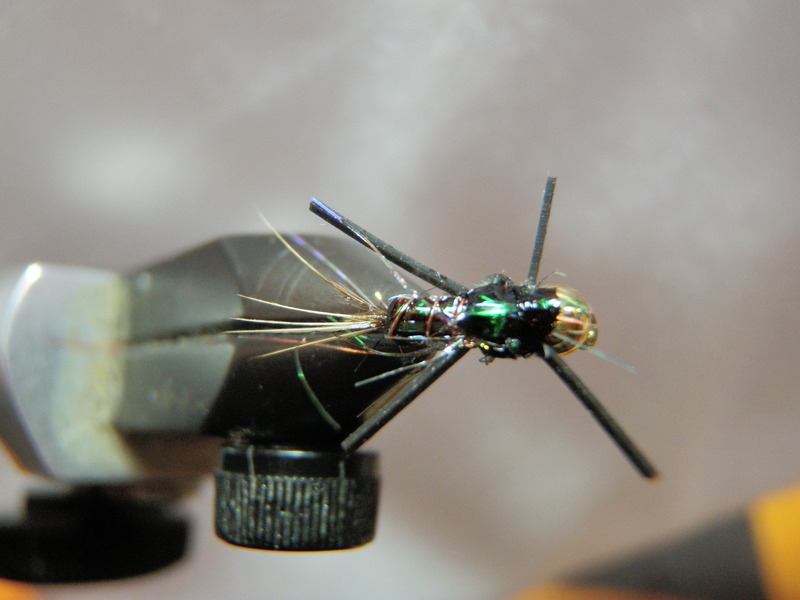 Early in the season, particularly on the Arkansas River, a caddis with a dark body is highly effective. Deer hair caddis with a peacock body are probably a better imitation of the caddis that hatch in thick clouds on the Arkansas; however, I’ve found that a dark olive-brown body caddis also fools fish. 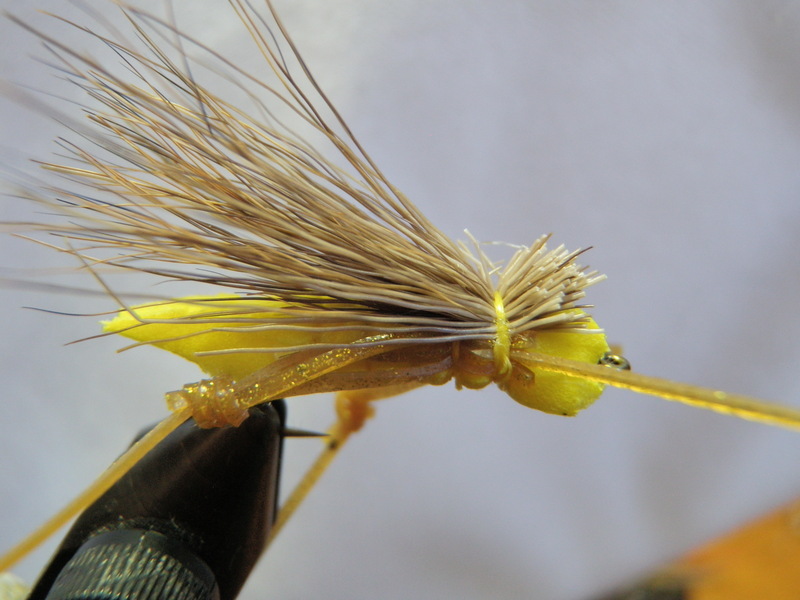 In addition this fly produces during other early season caddis hatches on various Colorado rivers so it is more versatile. 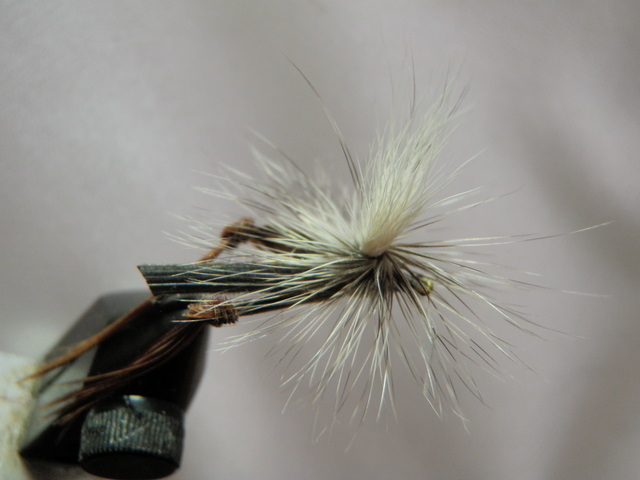 Since I was on a roll making 20 light gray deer hair caddis, I simply swapped out the tying thread and dubbing and continued producing size 16 deer hair caddis with a dark olive-brown body. I made 15 of these to go along with the supply that already occupied my fly box.